Dr. Josh was enjoying an exciting time in his early 20s as a newlywed. He knew that adventure and a bright new future lay ahead; the only thing getting in his way of true joy was his job. He was so unhappy going to work he would have knots in his stomach. “It was sucking the life out of me daily.” That’s when he knew he needed to find a career he would be passionate about. Uncertain of where to take his career, Dr. Josh talked with people in all sorts of related careers and none of those careers intrigued him. The uncertainty became discouraging. “I only had one choice at this point — pray!” So that’s what he did. He prayed earnestly for two years, asking God for direction and guidance toward a new career. After years of schooling, Dr Josh received a Bachelors of Science and then went on to Sherman College of Chiropractic in South Carolina to receive a Doctorate of Chiropractic. Dr. Josh was finally ready to open his first practice. He started his first practice in a multidoctor clinic on the East Coast. Although the stint was brief, Dr. Josh quickly learned how to treat people effectively and help them get better as fast as possible. Dr. Josh is married to his lovely wife Keri, and the two of them have four children together. 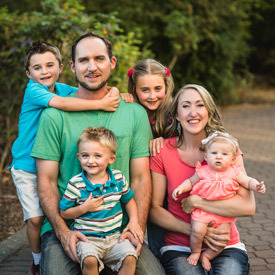 After having their first child, they felt a strong desire to move back home to Spokane. “This is where both my wife’s and my roots lay, right in Spokane.” Now at 180 Chiropractic Wellness Center, Dr. Josh happily educates his patients on the true philosophy of chiropractic care and how it naturally allows your body to heal. He and his wife are pleased to be back here to have the opportunity to serve their family, friends and of course the great people of this community. They spend a lot of time with family staying active outside and enjoying all that Spokane has to offer. They also enjoy traveling and supporting their church.